Wahl Easy Ear Cleaner is a carefully balanced formula that will effectively remove dust, dirt and ear wax from your pet’s ears with little or no rubbing. A free-flowing cleansing fluid based on natural ingredients, Wahl Easy Ear Cleaner also includes aloe vera gel and menthol to soothe the ear, camphor to assist in reducing inflammation and eucalyptus to discourage ear mites and fleas. 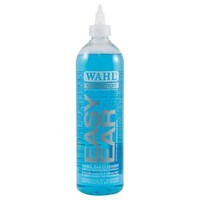 Wahl Easy Ear Cleaner is suitable for use on most animal ears and can be used as often as necessary.